Kick-Out!! Wrestling: Guest Post: Happy Birthday Mae Young! This is a Guest Post from Rosie the Kick-Outer, cross-posted at her blog Spare Candy, in her weekly "In History" column. Johnnie Mae Young, often known as Mae Young, was born March 12, 1923, happy 88th birthday to her! Her story is perhaps unlike any other in the business, currently working as a WWE Ambassador like many legends of the past, but even sometimes working the occasional match! Young's influence on women's wrestling has been largely forgotten to the years but her legacy cannot be denied. While men were overseas during World War II, Young helped pioneer women's wrestling and trained several generations of workers in the following decades. Though she's primarily known now as a comedy character in WWE, she's wrestled throughout North America, winning several different championships and has the distinct honor of being a member of both the Professional Wrestling Hall of Fame and the WWE Hall of Fame. Her role as a pioneer began at the age of fifteen when she joined her high school's boys wrestling team at the age of fifteen. You have to wonder how common that was back in, what, 1937? Young girls in 2011 still struggle to be taken seriously on high school wrestling teams and yet Mae Young managed to do it in the less-than-progressive 1930s with training from her brothers. While still in high school, Young challenged then-World Champion, Mildred Burke, to a match. Promoters refused, but she managed to challenge the top two contenders for the championship in a shoot fight and beat them each in mere seconds. In 1941, Young, and Burke, brought women's wrestling to Canada while working for Stu Hart, the patriarch of perhaps the most famous family in all of professional wrestling. She continued to work with Burke throughout the 1950s, becoming the first female wrestlers to tour Japan after WWII. She won her biggest title in 1968 when she became the NWA's first ever United States Women's Champion. In 2005, she starred in the documentary Lipstick and Dynamite, chronicling the careers women wrestlers from the 1950s. If you have Netflix, this documentary is on the Watch Instantly feature! Here's something wild: Young holds the distinction of being the only professional wrestler to wrestle documented matches in nine different decades, having her first in 1939 and her latest match in 2010. The legendary Lou Thesz held the previous record, competing across seven decades. It is quite possible that this feat will never be duplicated, which sums up the career of Johnnie Mae Young quite well. It is truly amazing to know that she has wrestled for as long as she has, even if her most recent match required the help of every other Diva on the WWE roster. 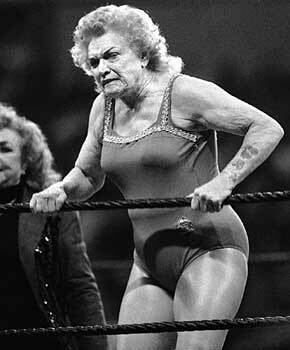 If anyone truly deserves to be called a "legend", it is Mae Young.